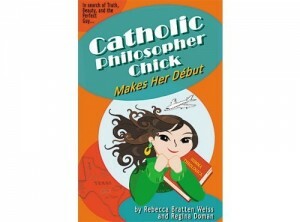 Catholic Philosopher Chick Makes Her Début is the intelligent Catholic woman’s beach read. This book is so much fun that you won’t want to put it down until you have turned the last page with a blissful sigh of contentment. Rebecca Bratten Weiss and Regina Doman bring Cate Frank to life and make her a heroine you would want to share a slice of cheesecake with. Cate, a former fashion writer, has struck out on a new path in life. A Jewish convert to the Catholic faith, she is headed to the Dominican University of Houston in order to immerse herself in the works of Thomas Aquinas and to find the perfect guy. She convinces the intimidating Dr. Hastings to allow her to take the famous “Suminar,” devoted to the study of the Summa Theologica, even though she is a first year graduate student and therefore not eligible, but when she walks in the door she finds herself to be the only woman in a group of men. Among those men, of course, is Justin, “the perfect man,” and Sean, who is anything but. Cate manages to balance weight issues, her love of good food, fashion disasters, a party-girl roommate, parents who think she has gone off the deep end, and her own natural inclination for getting into difficult situations along with heavier philosophical concerns. On her journey, she will make some valuable friends and learn a few lessons about herself and her place in the world. One of my favorite lines in this book is when Cate muses, “Whatever God wants me to be, it must be something as unique as a snowflake.” Any woman who has struggled with what it means to be a Catholic woman today and what one’s individual vocation is will appreciate and sympathize with Cate’s inner turmoil. While having studied St. Thomas Aquinas in depth is not necessary to appreciate this book, it helps to have a nodding acquaintance with his style of writing and philosophical thought. Also, if you are like me and your Latin has gotten a bit rusty over the years, you will want to have a Latin/English dictionary or your favorite on-line translator handy to fully appreciate the wit of the chapter titles. Catholic Philosopher Chick Makes Her Début is a great addition to the genre of Catholic fiction. Weiss and Doman make an incredible writing team, and one can only hope that more books of this quality will be coming our way in the future from this talented duo.